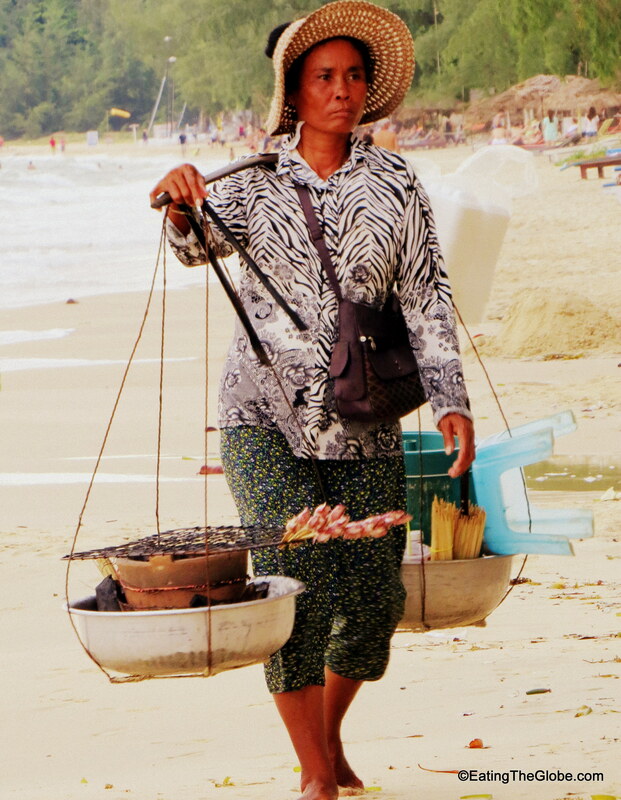 You will see her long before you know what she is selling, a vision of determination and hard work walking down the beach. 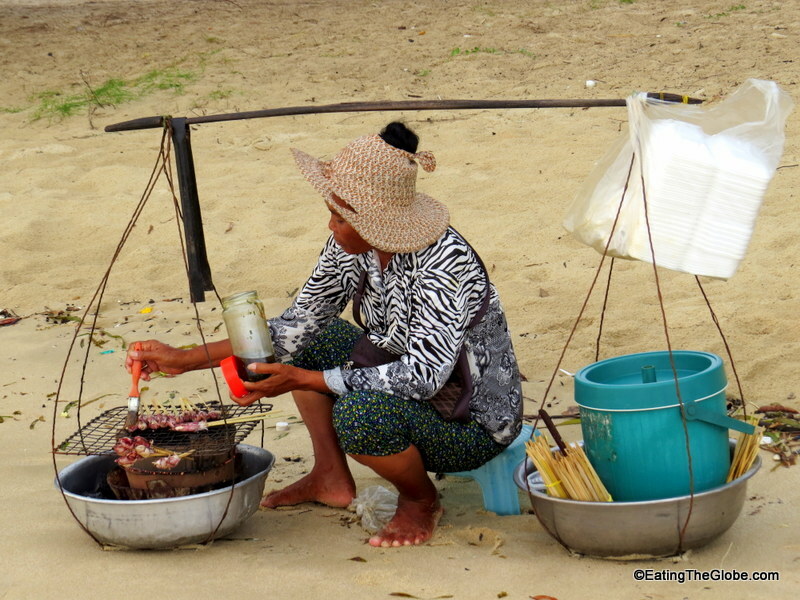 On her slender shoulders she carries a bar which carries a stepstool, a grill, and all the necessary tools to make your lunch. 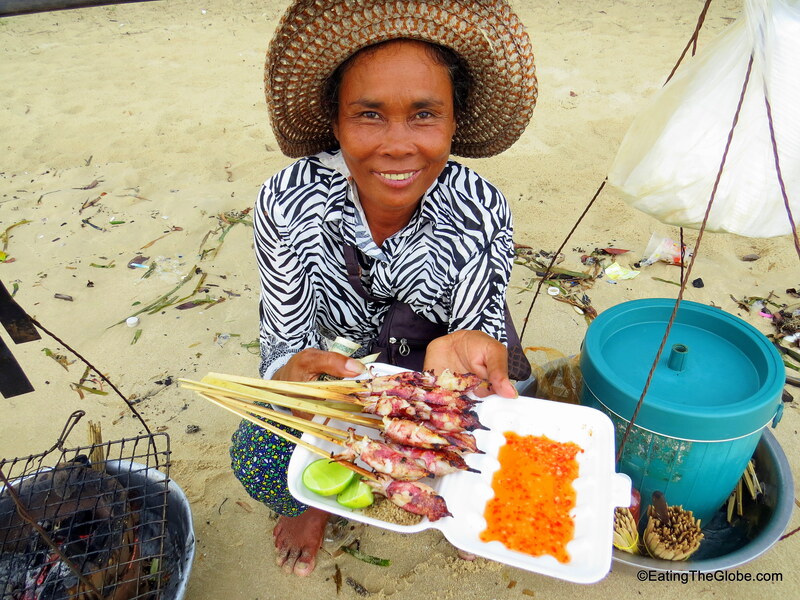 If you are on Otres Beach just down the way from Sihanoukville, Cambodia, you must stop her and order her beach food. She makes the most excellent, melt in your mouth calamari that I have ever had. And, I’ve had some pretty amazing calamari. You will get ten skewers of deliciousness for $3. (And, yes, she accepts US dollars.) 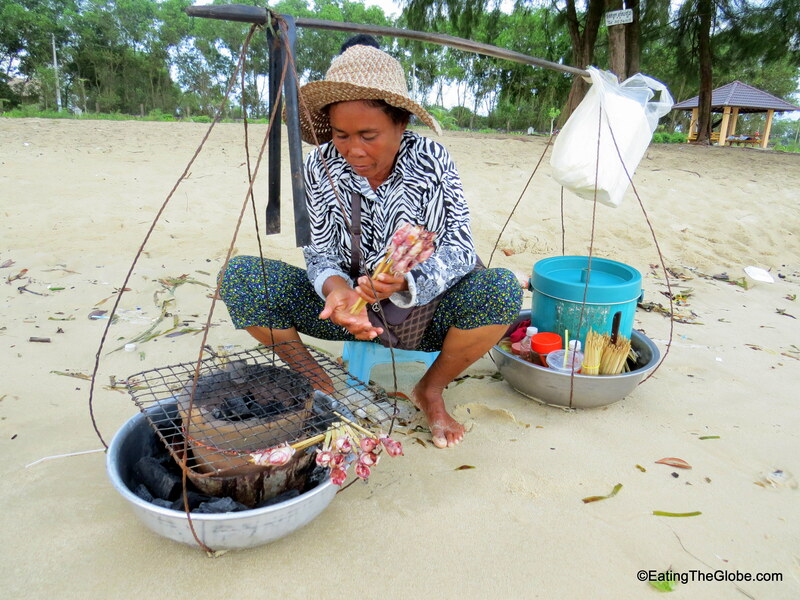 Sit back and watch as she sets up her grill in front of you right in the sand. Watch as she meticulously cooks each one to perfection. 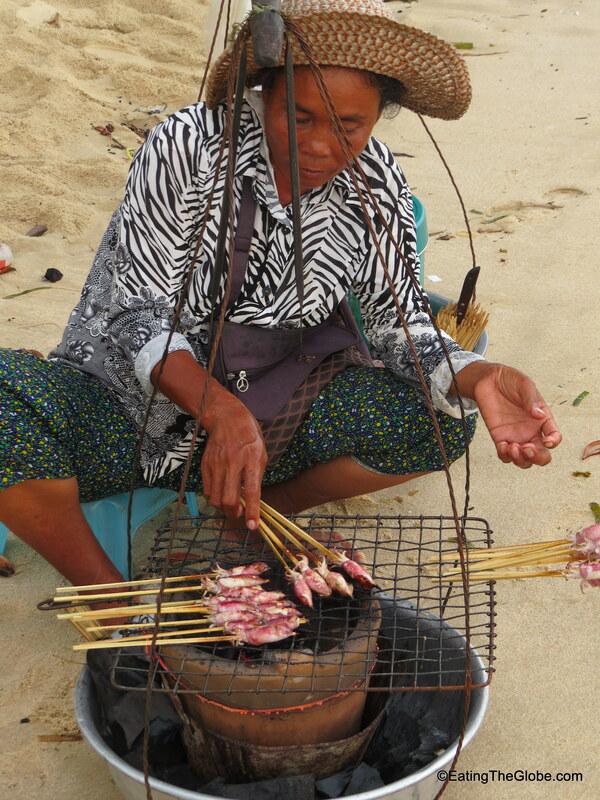 She has spent years cooking this and only this, so you know that each one is being cooked with practice and skill. She bastes each one with a special sauce and you salivate as the sound of the sizzling grill mixes with the smell of freshly grilled seafood. Sit back in the sand. Enjoy it with a squeeze of lime, the fiery pepper, and spicy sweet chile sauce. This will be a beach food meal to remember. 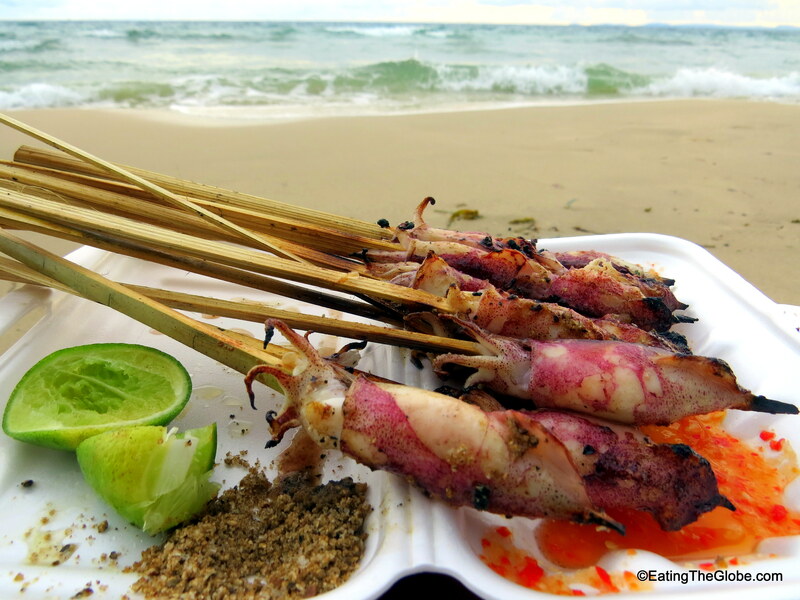 10 Responses to "The Beach Food You Won’t Want To Miss On Otres Beach,Cambodia"
Don’t think I’ve ever really had great calamari before as I’ve only had it in a couple of restaurants where it was quite chewy and it just put me off – but I’m fairly sure my opinion would change if I were to try it in this way and in this setting! Looks fabulous! Looks really yummy, ive only ever tried calamari in restaurants where it is served in bread crumbs. This definitely looks much better. I love your photos. Calamari will never be the same again…. Very cool and yummy experience! Definitely an authentic experience! Thanks for sharing this bit!! Yum! Calamari is a favorite of mine and it hardly gets fresher than this. That looks like some awesome street food! She must be so passionate about cooking her calamari to perfection–it seems like she knows how to cook the perfect sea food for anybody’s taste buds. Maybe one day I’ll find her in Cambodia and see what all this hype is about! I highly recommend it. 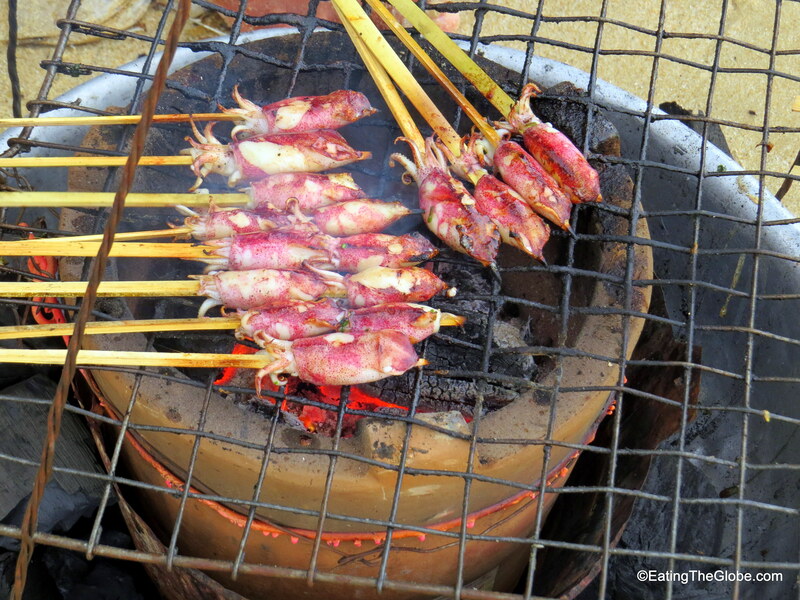 It was one of my favorite street food dishes ever!